Honestly, you could’ve just copied and pasted the Copa review, change the date, and change the title. Another game with a slow tempo, lack of movement, and poor individual defending. I don’t know if you’ve had the chance to watch the 2 goals Tottenham scored today against Arsenal, but the runs they made in those goals were the runs our forwards use to constantly make. Lennon’s goal in particular was remarkable similar to Sanchez’s goal against Getafe. Diagonal run from the right flank to center. Anyways, what do you think? Against Milan; Villa as a CF, Messi right behind him but shaded towards the right, Sanchez at LW, Cesc and Iniesta in midfield, Alba to be more conservative and aided by Sanchez, Alves with the entire right flank to himself. I’m hypothesizing Villa to occupy the CBs and provide Messi with someone to play 1-2’s or through balls to. Sanchez at LW constantly running to get in behind the defense as well as tracking back to help Alba out on the left flank. Iniesta pulling the strings from midfield with Cesc offering runs into the box when the opportunity presents itself. Such as when the ball goes out wide with a chance for a low cross, or when Messi is dribbling. With Alba more conservative and with Sanchez helping, Pique can shift over a bit and be the tallest player right of goal to prevent the right to left cross that has become such a popular route of attack. 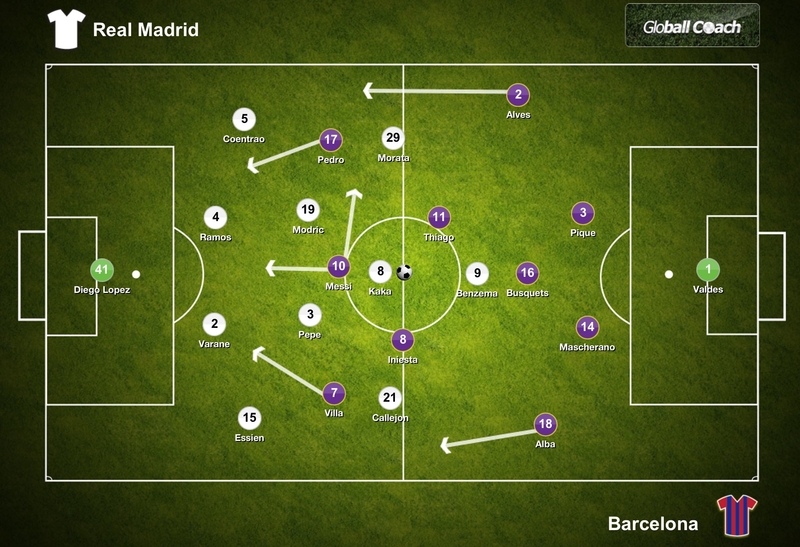 As for Messi, if the middle is too congested, he would move out to the right flank for space rather than dropping deep. I think the style of game adopted against Milan possibly matters more than the individuals chosen. 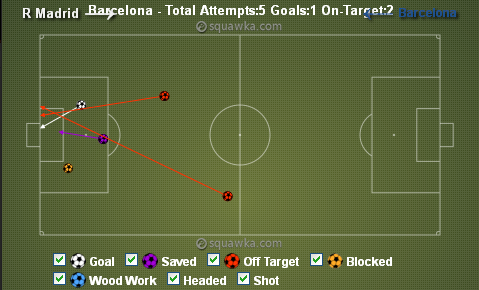 Barcelona must have a reference point in attack and for me, that would be Villa. There is no point moving him wide left. I would not play Cesc and Iniesta against top level opponents. Against lesser sides, when there is space they can be effective. Against opponents who restrict space, their roles become blurred. Villa at 9 with Messi as a 10. It leaves Alves open on the right though and they must be wary against el Shaarawy. Midfield trio of Busquets, Xavi and Iniesta. The tempo must be right and the intensity has to exist for the team to have an opportunity to progress. I think Xavi might be injured and miss the Milan game. Don’t quote me on that though, I’m not certain. Do you trust Thiago in such a match? Agreed on the tempo and intensity. Especially when pressing. Hopefully, aggressive pressing can limit the passer’s ability to get the ball to El Shaarawy. Very good analysis. I enjoyed it.